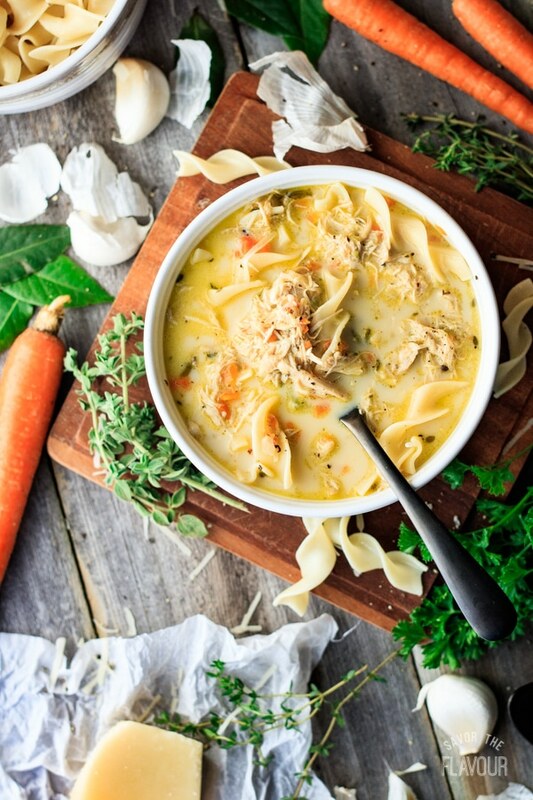 Chicken noodle soup is an old fashioned remedy for colds and flu. It’s super easy to make this creamy, from scratch soup on the stovetop. This kid pleasing comfort food is hearty enough to serve for dinner, too! A month after my beautiful Bookworm Beth 📚🐛 was born, a church friend gave me a big container of creamy chicken noodle soup. We quickly devoured it all up, and I had to have the recipe. Over the years, I have done some tweaking to it, by changing up some of the spices, omitting the bouillon cubes, adding minced garlic, and sauteing the vegetables. I also prefer to cook the noodles separately, as they tend to swell up in the soup. If you like your soup extra creamy, just double the evaporated milk. If you have a sick child in the house, or you are just craving something homemade, make up a big batch. This soup pairs well with our rustic cob loaf and our hearty multigrain bread. 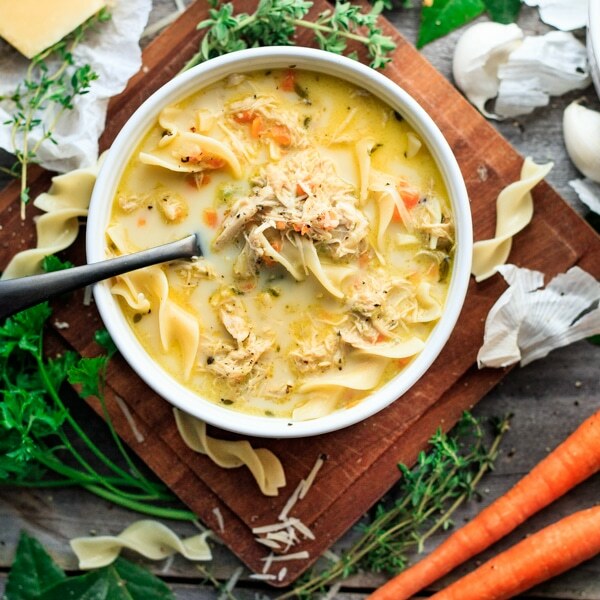 Make your own chicken stock for the best flavor and health benefits. Leave the onion skins on for the stock to give the stock more color. Add 2 cans of evaporated milk instead of 1 for extra creaminess. Keep the noodles separate from the soup to keep them from getting soggy. Fighting off a cold? 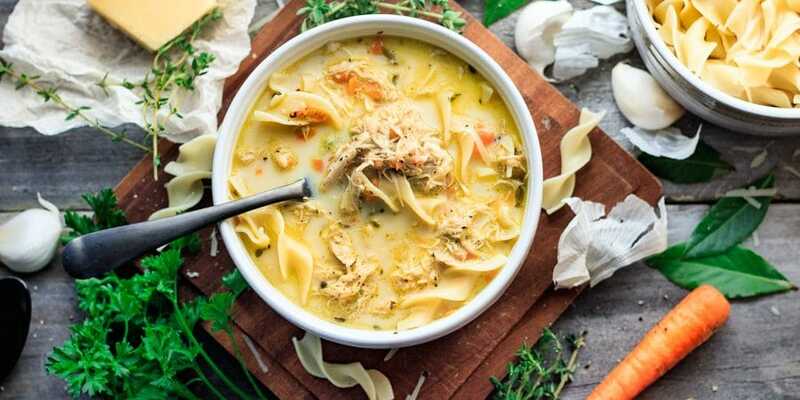 Try these other healthy soups to help you feel better. 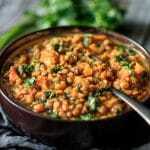 Detox Moroccan Lentil Stew: it takes just 30 minutes of prep time (plus cooking) to make this nutritious dinner. Healthy Carrot and Ginger Soup: coriander, cumin, lemon, and coconut milk flavor this vitamin A-packed soup. Kale & Quinoa Stew: a hearty meal filled with healthy veggies and vitamins. 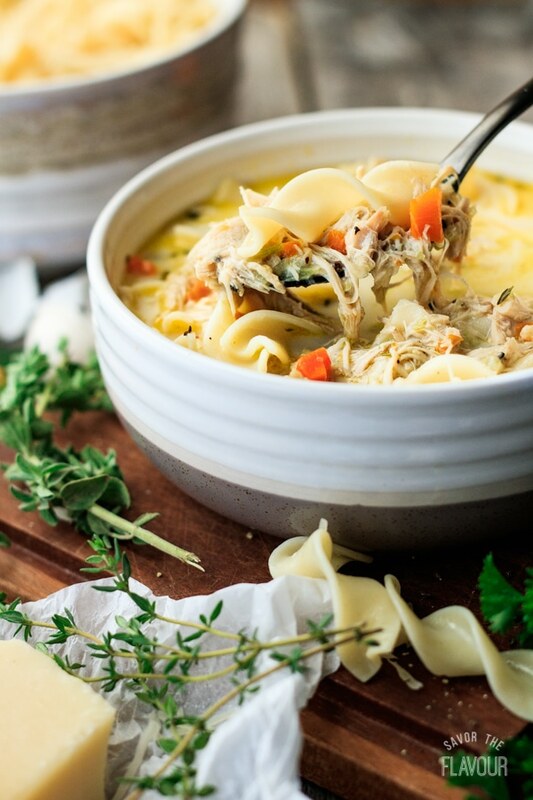 Share your thoughts on this chicken noodle soup by leaving a recipe rating below. Rinse the chicken and remove the giblets. Place it in a large soup pot and cover with about 9 cups of filtered water. Add the yellow onions, carrots, celery and bay leaves, then cover and bring to a boil. Let the stock simmer for 2 hours, then remove the chicken. Let it cool and discard the skin and bones. Strain the broth by pouring it through a sieve lined with cheesecloth, then pour it back into the soup pot. Discard the carrots, onion, and celery and skim off the fat. Melt a tablespoon of butter in a skillet set over medium heat. Saute the carrots, onion, celery and garlic with a sprinkle of salt until soft, then add the cooked vegetables to the pot of chicken stock. Shred the meat from the chicken to get 4 1/2 cups of meat, then add it to the broth. Stir in the spices, bring to a boil, then simmer for 10 minutes. Adjust seasonings to taste. 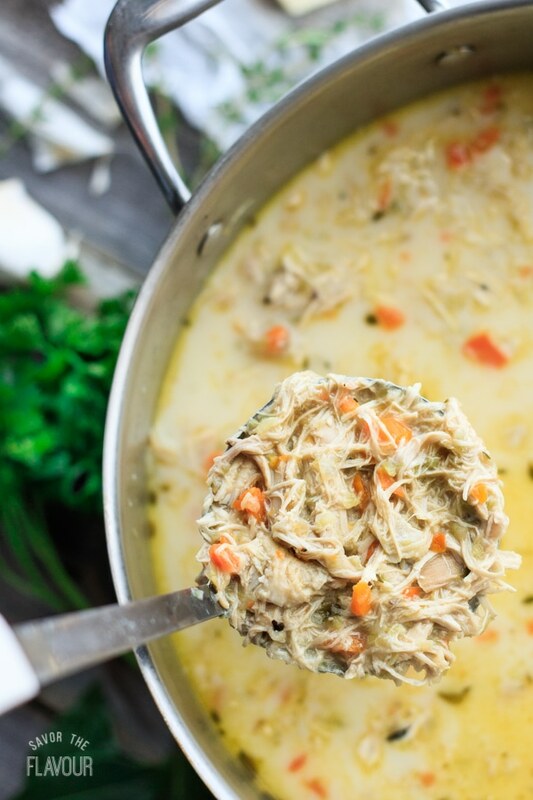 Remove the soup from the heat and add the evaporated milk and Parmesan cheese. Cook 2 1/2 cups of wide egg noodles for 5 to 7 minutes in a pot of salted boiling water, stirring occasionally. Drain the noodles, then toss them in a bowl with a tablespoon of olive oil to prevent sticking. To serve, place some noodles in the bottom of an empty bowl, then ladle the soup on top. Serve warm with a garnish of black pepper and Parmesan cheese. 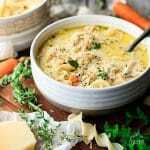 Use two cans of evaporated milk to make the soup extra creamy.